Complete the academics through the PADI eLearning system (about 12 hours of online work). In the PADI eLearning program you will learn the required scuba principles and concepts needed to continue your scuba training in the pool. The eLearning has to be completed before the pool session. To enroll you must be 10 years old, or older. Open Water Diver Touch, which is a tablet-based version of the PADI Open Water Diver manual, and is available on iOS devices (such as the iPad,) and Android devices (but not smartphones.) It integrates the most updated text, learning objectives, and knowledge reviews, as well as clips from the PADI Open Water Diver video. Either version is suitable for continuing your scuba training in the pool. Please specify which eLearning version you prefer at checkout. When you book your pool session online (button below) you will be prompted to purchase your eLearning and you will be all set to start learning scuba, and you can choose a date for the pool session. All our pool classes are semiprivate with 4 students max per instructor. The World Recreational Scuba Training Council (WRSTC) allows any training agency to teach 8 scuba students at a time for in-water training. 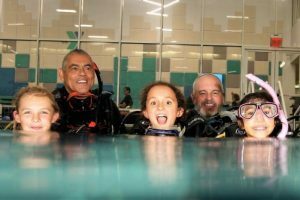 Here at Rey Diving, we have a policy of 4 students max per instructor to maximize instructor’s attention to each individual in the class. Our pool classes fill quickly, size is limited to 8 students per class with two instructors. Our pool location is the McBurney YMCA, —125 W 14th Street in Manhattan. Saturday or Sunday (one day only) from 11:00 am to 8:00 pm. During the pool session, first you will fill out the PADI student record file, and complete a quick review with your instructor. Then you will proceed to the pool with your instructor for your confined water training. Tuition $395 per person. Includes all scuba equipment rentals to be used in the pool! Including mask, snorkel, fins, booties, wetsuit, BCD, tanks, and regulator. If you need to buy equipment for your trip, please let us know, we keep a stock of brand new basic scuba equipment. Your tuition also includes your Logbook, your Recreational Dive Planner (RDP table, Imperial version) which you need for taking the quick review when you meet with your instructor. And we always give you a referral form, which you will need to take to your certifying instructor, either locally or abroad. Prerequisites for the pool session: Having completed the eLearning by the time of your pool session. You need adequate swimming skills and be in good physical health. No prior experience with scuba diving is required. This option consists of Thursday (Part I) 5:00 to 11:00 pm, and the next Thursday (Part II) 7:00 to 11:00 pm. This is the same program as the one-weekend-day option, only that is split in two Thursday evenings. First, you will fill out the PADI student record file, and complete a quick review with your instructor, to then proceed to the pool for the first set of in-water skills. During part II you will continue your scuba skills in the pool to complete your confined water training. Tuition $395 per person. Includes all scuba equipment rentals to be used in the pool! Including mask, snorkel, fins, booties, wetsuit, BCD, tanks, and regulator. Your tuition also includes your Logbook, your Recreational Dive Planner (RDP table, Imperial version) which you need for taking the quick review when you meet with your instructor. And we always give you a referral form, which you need to take to your certifying instructor, either locally or abroad. After you complete the steps above (eLearning and pool session) you will be ready for your four open water check out dives, and certification. These check out dives can be done in one of Rey Diving’s scuba trips to some of the most beautiful and interesting scuba destinations (if you don’t find here a trip that suits you, or need a specific date, please give us a call, we can arrange your scuba trip to some of the most popular scuba destinations). You can also make the checkout dives locally with us on one of our scheduled weekends to Dutch Springs, PA throughout the warmer months starting in May, and throughout September. Finally, if you have a planned vacation and want to complete your checkout dives abroad, on your own trip, that’s fine too, we provide everybody with a referral form for you to take it to your certifying instructor abroad.